Healthy Families and Communities Committee meetings are held in the Council Chamber at 1:30 p.m. on the Thursday prior to the first and third Fridays of each month; however, the schedule is subject to change. Social services and animal management programs and related grants, including grants of interests in real property. Cultural, leisure, recreational, and parks matters. Management and potential acquisition of public recreational lands, including parks, open space, natural and cultural resources, and scenic view preservation, including grants of such real property. 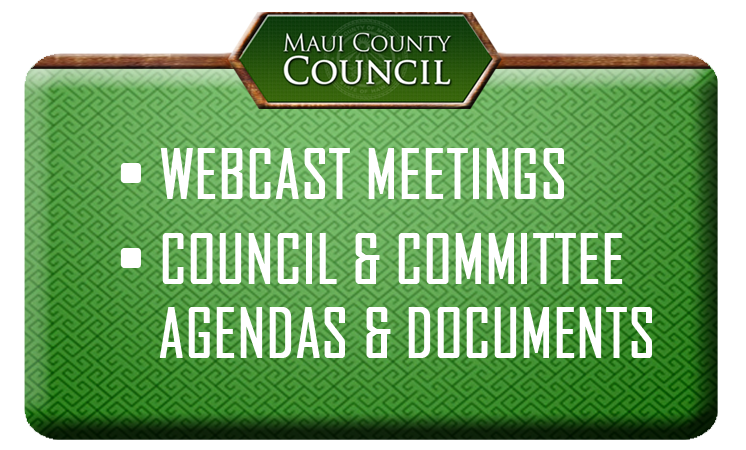 Authorization of concessions at and permits for events and activities conducted at Maui County’s public parks and facilities. Operations and performance audits of the Department of Parks and Recreation, and the Department of Housing and Human Concerns (except the Housing Division), including the operation oversight of any grants they administer. Strengthen Social and Healthcare Services. Improve Parks and Public Facilities.